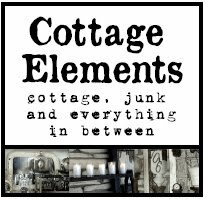 Cottage Elements: Graduation Decoration on the Cheap! Graduation Decoration on the Cheap! My baby, Rebekah, graduated this month from high school. Wow, hard to believe! It just seems like yesterday she was going off to kindergarten. Please tell me, where does the time go? So on June 13 we had an Open House. And like everyone else, we needed to do it on the cheap. So with little money spent, I decorated using most items I already had. The main expenses for decorating? Ink and paper for the pictures. And my vintage items were great staples to display them with. For my birthday, I had been given an Oleander tree which has the most beautiful pink flower on it. I decided to use that as my color palate for the outside, though I typically go with white and green. I love how the pink just seems to pop out! This vintage ladder with the fans are displayed on my porch throughout the spring, summer and early fall. For the Open House, I just embellished them with flowers and pictures. I love black and white pictures so I took pictures of Rebekah and the family and scanned them onto card stock. I then cut them with pinking shears. Some I attached magnets to, some I attached to metal flower garden picks to and some I just attached using office clips. We're all big fans of Rebekah! And aren't this children's boots just the cutest! More fans! And I'm a big fan (oops, sorry) of cement urns. I picked up both the Coke cooler and the popcorn machine at a yard sale last year with the intention of using them at Bek's Open House. They were a definite hit and added more "fun" to the party! Another great vintage piece to hold pictures. This piece of tin displays some more of Rebekah's pictures. Here I have a large fern sitting in a vintage tin stand. Ooops, another photo op! Next post....will be of the inside. But I think I'm done for now. Don't want to over extend myself, now do I. Hope this post finds you all well! 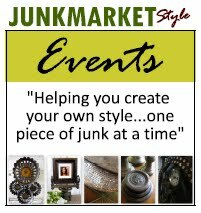 Take care and happy junking! 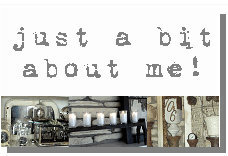 PS What do you think of the new look of my blog? I've been tweeking it a bit! I love the junky graduation decor--don't think my teen will let me do his graduation up with junk next year. I love all the details and how you decorated outside! The ladder and the popcorn machine... so cool!! Love your new look here Lani! Your house looks great all dressed up for open house! I am impressed what can be transformed with a great imagination. Loved everything...especially the fans. I have to say that in my opinion the prettiest decorations were y'alls smiles. I know you are so proud and you should be. P.S. I just saw photos of the two of y'all over at Amy's. Good grief but y'all sure are beautiful! LOve your new blog design Lani, and love all your sweet touches for Rebekah's special day!!! Congrats!! Looking forward to the inside photos too. I love the new look of your blog! Your outdoor decor is the best, especially the ladder. Can't wait to see what you did inside. Congrats to Rebekah!! I remember you doing this for your Son. Great projects then and now. Can't wait to see more. Love the graduation decor! You are so creative and have a great talent for putting things together! Great job!! Love the new look and always love reading your blog. Thanks for sharing! Rebekah graduated already? Time fly's. You most be so proud of him. That one more step towards adulthood. The French Flea Opens on Thursday! Is there a Doctor in the House???? ?